Types of Media The Zukor Media Player offers clinicians near unlimited choice of media input, including DVD movies, video files, music CDs, audio files, and still images (photos). The Zukor Media Player's alternative media options include a built-in fractal generator and kaleidoscope. Plus, with an upgrade, YouTube streaming videos can be used. No Movie Previews or Menus The Zukor Media Player skips the movie previews and menu on movie DVDs and automatically loads to the first frame of the movie. You can jump directly to a specific movie chapter or use a slider to locate any specific spot on movie. You can also select any available movie soundtrack language from a drop down. DVD With the Zukor Media Player you can play your patient’s favorite movie DVD directly from your computer’s DVD drive. Alternatively, video, audio or image files stored on a DVD can be accessed and played from the DVD or imported into the Zukor Media Player’s Media Manager. CD The Zukor Media Player can directly access any music CD from your computer’s CD drive. Alternatively, video, audio or image files stored on a CD can be accessed and played from the CD or imported into the Zukor Media Player’s Media Manager. Memory Stick Video, music or image files can be accessed from any USB memory stick (thumb drive). They can be played from the memory stick or imported into the Zukor Media Player’s Media Manager. External Drive Video, music or image files can be accessed from any external hard drive. They can be played from the external drive or imported into the Zukor Media Player’s Media Manager. Supported Media File Formats The Zukor Media Player supports the most common media file formats for audio, video and images: video files (AVI, MP4, WMV, MKV), audio files (MP3, WAV), image/photo files (JPEG, GIF, PNG, etc.). These files can be played from your computer’s hard drive, from a CD or DVD, a memory stick (thumb drive) or external hard drive (flash drive). Alternatively, the files can be imported using the Zukor Media Player’s Media Manager. Media Manager The Zukor Media Player includes a helpful, easy-to-use Media Manager which serves several useful purposes. First, the Media Manager allows simple importing and organization of videos, music and images in a Library. Within the Library the names of the items can be changed, items can be previewed without having to locate the file itself, and “tags" can be added so that similar items can be easily grouped together. This can be very helpful because often the file names of videos, music or photos are cryptic or vague. For instance, if you import into the Library a collection of JPEG image photos from the Internet, a CD or memory stick, you can then View each image and change the image name to better match the actual content depicted in the photo. The same can be done with video files and music files. Second, within the Media Manager each type of media (videos, music, photos) can be organized into multiple playlists by topic using the Playlist Manager. Within each playlist you can easily change the playback sequence of the items on the playlist. You can also choose to loop the entire Playlist or have a single item loop, such as looping a specific video so the same video plays over and over again. Photo Puzzle (Image Reveal) As an alternative to videos, clinicians can use photographs (or any image) for “photo puzzles” where the picture reveals itself piece by piece as training criteria is met. The Zukor Media Player includes a library of 100 high-quality photos (baby hippo, Budas in Japan, African sunset, green Iguana, etc.) and you can import additional photos as JPEGs or any common image format. The photos can be organized into playlists by topic using the Zukor Media Player’s “Media Manager” and you can easily change the playback sequence. Patients can bring in their favorite photos on a memory stick or CD and you can create a unique photo playlist for their feedback training. Using the Zukor Media Player’s “Soundtrack” feature you can add music to the photo puzzle from a music CD or MP3 file (or other common audio format). The music can simply play during the training session, or become part of the feedback by using the Audio Play/Pause effect or the Volume Up/Down effect. Photo Puzzles are highly-intuitive feedback used by many clinicians who want simple, mellow feedback. Fractals As an alternative to videos, clinicians can use Fractals in the Zukor Media Player for simple, mesmerizing feedback. The Fractals colors, morphing, zooming and movement can be adjusted prior to playback using simple sliders and demoed in advance within the Fractals settings. Different Fractals presets can be created and named for later use. For instance, you can have a “psychedelic” preset, a “children's colors” preset, etc. The same feedback effects used for videos, such as Zoom Out, Pixelate, Flames, or any of the 24 feedback effects, can then be used to signal to patients when they are meeting feedback training criteria. Using the Zukor Media Player’s “Soundtrack” feature you can add music to the Fractals from a music CD or MP3 file (or other common audio format). The music can simply play during the training session, or become part of the feedback by using the Audio Play/Pause effect or the Volume Up/Down effect. Fractals offers interesting feedback for clinicians who want simple, engaging feedback. Kaleidoscope As an alternative to videos, clinicians can use the Kaleidoscope in the Zukor Media Player for simple, relaxing feedback. The colors in the Kaleidoscope can be adjusted prior to playback using simple sliders and demoed in advance within the Kaleidoscope settings. Different Kaleidoscope presets can be created and named for later use. For instance, you can have a “Summer Colors” preset, a “Playful Colors” preset, etc. Using the Zukor Media Player’s “Soundtrack” feature you can add music to the Kaleidoscope from a music CD or MP3 file (or other common audio format). The music can simply play during the training session, or become part of the feedback by using the Audio Play/Pause effect or the Volume Up/Down effect. The Kaleidoscope offers fun feedback for clinicians who want simple, mellow feedback. Feedback Effects After selecting the media (DVD movie, video, music, fractal, etc.) the clinician then chooses from among 24 feedback effects. Most of the effects are visual effects which impact the picture, but some also relate to the soundtrack. More than one feedback effect can be used at the same time driven by all training events together, or a different feedback effect can be assigned to specific training events. The Feedback Effect Redefined The Zukor Media Player redefines the basic concept of feedback in a media player. When most clinicians think of feedback effects they think of Start/Stop, Zoom Out (video screen shrinks) or Contrast (making the video dark). These types of feedback are negative, in that the patient is punished when not meeting criteria and rewarded by getting to watch the media without the feedback effect. The Zukor Media Player of course includes these basic, negative effects, but also offers feedback effects that are positive and others that are negative but more subtle. Positive Effects The positive feedback effects, such as Bubbles, Fire, Snow or Sparkles, are actually “potentially” positive because it depends on what media it is being used with and also likely the age of the patient. For instance, one of our customers uses the Snow effect with the movie Frost with a 12-year-old girl. Another example is using the Fire effect with a Harry Potter movie. Subtle Effects As for subtle effects, such as Color Filter, Grayscale or Rain, they are still negative, but much less so than an absolute effect like Start/Stop. For instance, using the Color Filter effect still allows the media to viewed, but simply tints the image in whatever color is selected. The subtle effects can be made even more subtle by adjusting the settings for the individual effect. For example, one of our customers uses Greyscale, but at only 20% maximum. He has reported excellent training progress using the effect in this manner. Feedback Effect Settings Each Feedback Effect can be fine-tuned by adjusting the Update Rate in milliseconds, the Minimum and Maximum amount of the effect, and the Adjust By amount (how much the effect changes). Plus, certain effects have additional unique settings, such as the color of the Color Filter effect or the overlay pattern of Overlay Effect. MIDI (Musical Instrument Digital Interface) MIDI is a standardized digital music instrument tool that allows easy creation of a wide variety of electronic sounds. 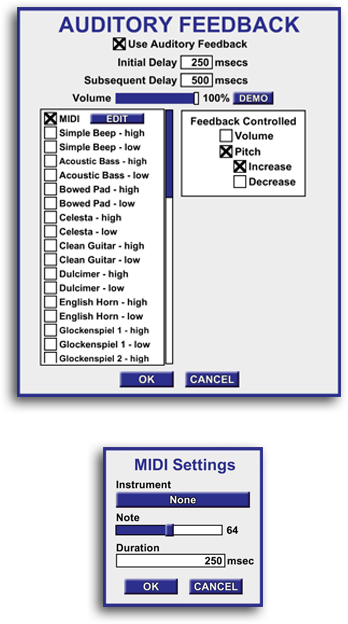 With MIDI you select from one of 159 “Instruments" from a drop down. Then using a slider you select the “Note” which means the pitch of the sound. Lastly, you select the “Duration” of the sound in milliseconds. The sound is then triggered in the same manner as any other feedback sound using the Auditory Feedback Options in the Zukor Media Player. Auditory Feedback OptionsThe Zukor Media Player’s auditory feedback can be driven by 1 to 16 feedback training events. If desired, each event can trigger a different sound. Additionally, for each event a true sound and a false sound can be assigned, making the Zukor Media Player useful for Alpha-Theta training, or any training modality which requires a different sound for a positive state and a negative state. The feedback sound’s delay intervals can be set in milliseconds. There is an option for “Feedback Controlled Volume” or “Feedback Controlled Pitch” so the volume or pitch of the feedback sound can increase or decrease depending on how well event criteria are being met. The feedback sound’s absolute volume can also be adjusted separately from the volume of the video soundtrack or music in the media being used. As for feedback sounds, the Zukor Media Player includes a collection of 52 high-quality feedback “tones” ranging from a simple beep to single note musical instruments. Each feedback sound has a high and low pitch version. All feedback sounds can be demoed in advance in the Auditory Feedback Options. Modality PresetsThe Zukor Media Player works with all modalities of neuro and biofeedback training, from Alpha-Theta to Z-Score, including 3 band “SMR” neurofeedback, HRV, BVP, EKG, GSR, Respiration and Temperature. 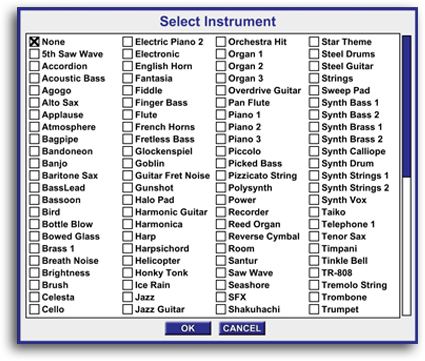 The most common modalities are available as presets and selected from a simple drop down menu. However, as the Zukor Media Player is not a stand-alone product, the events (modality) are first defined in the neuro or biofeedback system software. Feedback Mode The Zukor Media Player can process feedback in three ways: proportional, discrete per event or discrete all events. Further control of the feedback can be adjusted by changing the “Update Time” in the Settings for each Feedback Effect. Together these give the clinician complete control of the feedback training experience. 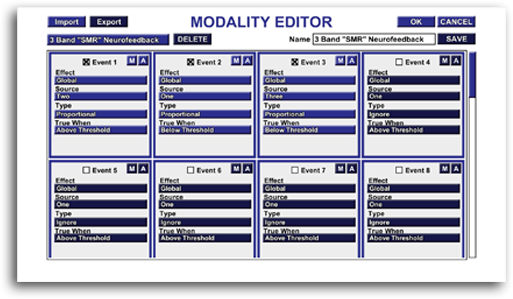 Modality EditorThe Modality Editor in the Zukor Media Player allows the clinician to create additional modalities using from 1 to 16 events. These new modality definitions can be saved and easily accessed later via the Modality preset drop down menu in the Zukor Media Player. 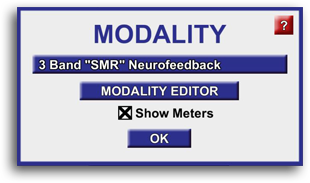 The Modality Editor is not a substitute for the modality settings in the clinician’s neuro or biofeedback feedback system software, but rather a way for the clinician to tell the Zukor Media Player how to react to the clinical settings defined in the neuro or biofeedback feedback system software. Patient Profiles Zukor Media Player uses profiles to remember all the feedback settings and scores for each patient. So, when the patient returns for their the next session, the clinician can start where they left off. 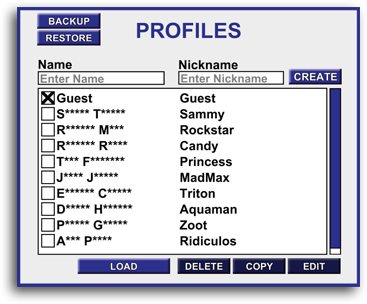 Each patient Profile also includes a “Nickname” feature so patients can select a fun nickname for themselves which is displayed on the Scores screen. 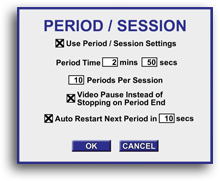 Period/Session OptionsClinicians can easily setup the number of periods per session, the length of each period and the optional Auto-Restart Next Period at a desired time interval. Meter OptionsThe clinician can easily turn on or off the event meters. Additionally, the color, opacity, sexual orientation (horizontal or vertical) and position of the meter can also be changed. Display The clinician can separately turn off different types of on-screen displays, such as the time, scores, etc. Video Screen The clinician can easily change the size of the video screen within the Zukor Media Player via a slider. Additionally, the video screen can dragged to any desired position. Graphics The Zukor Media Player can work in "fullscreen" or a resizable "window" mode. 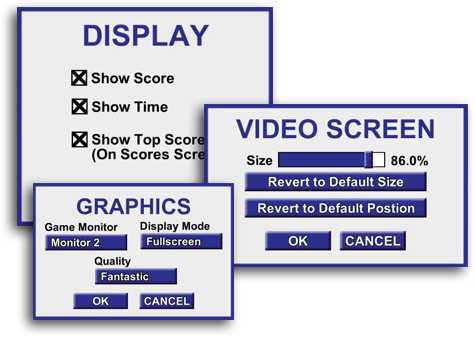 Clinicians can also adjust the Zukor Media Player's graphics quality lower or higher to meet the capabilities of their specific computer system. ScoresPatients earn training points for meeting event criteria, The point accumulation rate can be adjusted by the clinician. The scores are saved for each session within the patient profile. The Scores Screen data can be saved as a “screen grab” graphic file and as a Excel spreadsheet.